Democrats 2020 Logo Competition 2! Another batch of candidates have declared, so there's another batch of logos to review! As always, these reviews are offered in a spirit of good fun, and do not reflect my views of the candidates themselves. In fact, I don't have any views on the candidates themselves, because I am officially neutral. Cory Booker's logo is terrible. It feels very claustrophobic, the colors don't work together, and there's not enough contract between the blue and the black. This is part of a larger problem Booker has with graphic design. His entire website needs to be replaced ASAP with something that isn't painful to look at. Pete Buttigieg's logo would work better if he had a more distinctive first name. As it is, you need to stop and think which candidate the name belongs to. The last name is also difficult to read, which only compounds the problem. John Hickenlooper's logo is easily my second favorite of this batch. It's highly distinctive, even from a distance, and his name is fairly legible despite being ridiculously long. The mountain design also helps remind you of who he is, which is important considering how often people forget he's running. He also gets bonus points for using purple, because purple is the best color. Jay Inslee's logo makes him look like he's marketing a new line of text-based adventure games, now with expanded content to take advantage of the increased use of high-capacity 3.5 inch floppy discs. I'm concerned that his campaign will eventually be bought out by Infocom. Amy Klobuchar's logo looks like it was designed in a hurry in Microsoft Word, which is probably exactly what happened. Someone (presumably the Klobuchar campaign) had leaked an absolutely atrocious draft logo before Klobuchar announced her candidacy, and the logo was met with widespread ridicule. I'm guessing that they then redesigned the logo as fast as humanly possible so they could launch the campaign. Wayne Messam's logo is... decent. The gradient is a bit dated, but the text is fairly legible. It loses points for not stating the candidate's last name, which is important for a candidate as obscure as this. The only "Wayne" most people are on a single-name basis with is Batman. Beto O'Rourke's logo is Pete Buttigieg's logo done right. 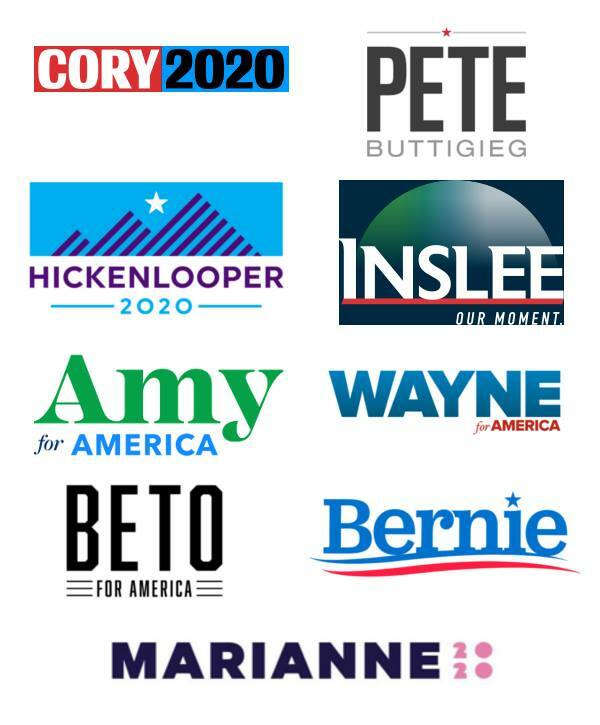 It highlights the most memorable part of his name, it gets rid of the pointless grayscale that makes Buttigieg's last name hard to read, and it repurposes the easily recognizable logo from his Senate run. It also ties into the candidate's established branding focusing on his first name. This is probably the third best one after Hickenlooper's, and would be superior to Hickenlooper's if the two candidates were in the same tier. As it is, I still give the edge to Hickenlooper because his logo helps remind the viewer of who he is, which is important for a long-shot candidate. Bernie's logo is literally the exact same logo that he used in 2016. I have to seriously question the wisdom of this. If Bernie had introduced a new logo, he would have been able to sell new bumper stickers to his supporters, thereby raising additional small donations. As it is, his supporters can just continue using their old bumper stickers, unless they've removed them, in which case they're fair weather friends who will be the first against the wall when the revolution comes. I also feel as though Bernie has missed a major opportunity here. This is an "old white guy from Vermont" logo, not a "cool hip Millennial who happens to be in his 70's" logo. I wish that Bernie had taken his hair-and-glasses logo from 2016 and made it official this time around. Bernie won the logo wars the last time around on the strength of that unofficial logo. He could have had a shot at greatness this time around by making it official. Marianne Williamson's logo is pretty decent. It's easy to read (except for the "2020"), and her first name is distinctive enough for it to be the main focus of the design. However, it also needs to include her last name, because she's a long shot candidate and nobody knows who she is. It also has very awkward dimensions, which are well suited to bumper stickers but poorly suited to yard signs. Commenting on this Blog entry will be automatically closed on May 17, 2019.